Milkweed Bugs in subfamily LYGAEINAE may be confused with the Coreid Bugs for the look similar in body shape. They can be distinguished with their membrane of forewing with distinct basal cell and less dense veins. The nymphal abdominal scent glands are between terga IV and V and V and VI. 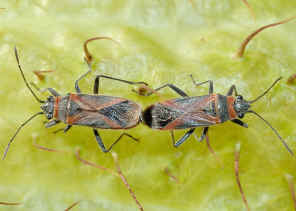 Lygaeid bugs in other subfamilies are usually small and cryptically colored ground dwellers. 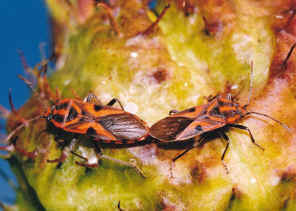 Milkweed Bugs in subfamily LYGAEINAE are of medium to large size, boldly patterned in red or orange and black warning colours, and are found on or in conspicuously placed plant seed pods. 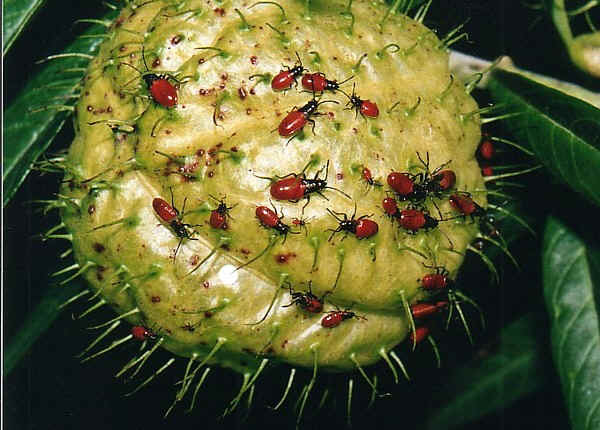 Nymphs are bright red and black in colours and different species nymphs look very similar..
Those bugs feed on many different species host plants and seeds of the "poisonous" plant family Asclepidaceae, Apocyanaceae, and Solanaciae. 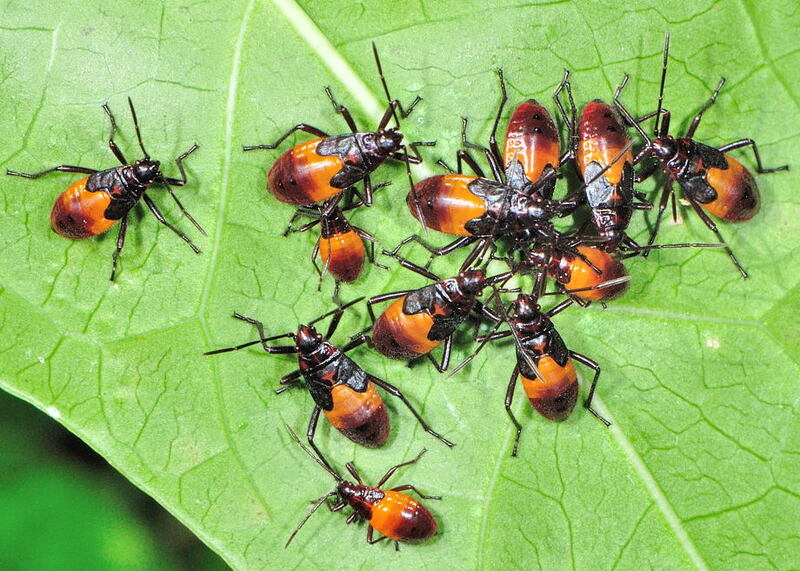 This feeding habit earned the subfamily LYGAEINAE the common name of milkweed bugs. Nymphs are early found on Milkweed seed pods. 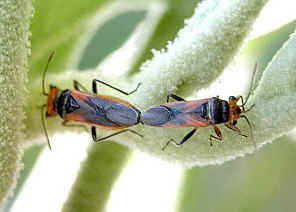 We commonly call the bugs in this genus Arocatus as Small Milkweed Bugs. They are small to medium in size and can be found on Milkweeds Asclepias sp.. Usually they were found in large number on host plants. Adults and nymphs of different instars stages were found on the same plant. We often found more than one species mixed feeding together. Genus Graptostethus and Spilostethus are closely related. 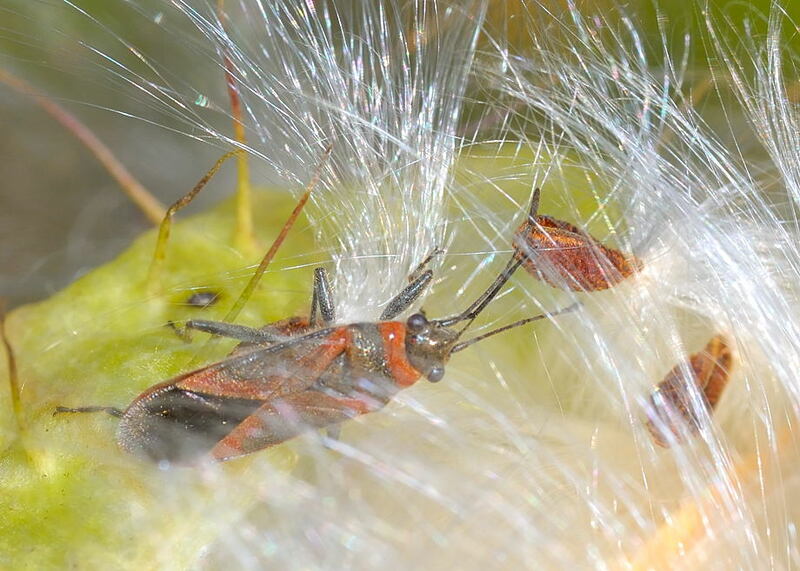 They were always found on Milkweed plants. 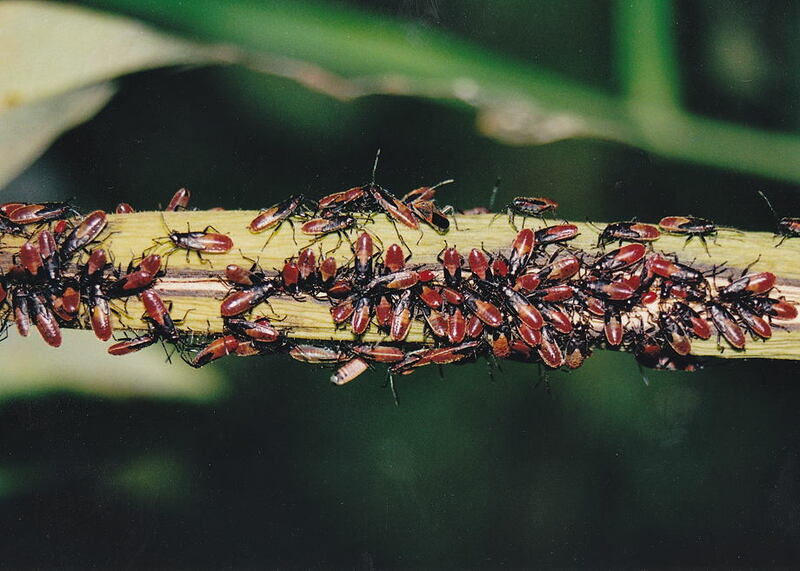 They are brightly red in colour with distinguish black patterns. The bug is colourful, with red head, brown thorax, yellow wing-covers and black wing tips. 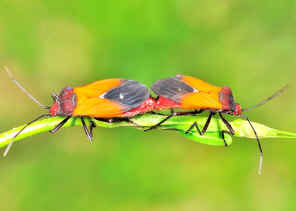 Its abdomen is bright orange-yellow with red tip. The bug is eye-catching when sitting on green plants.